The whole huge poetic world of Tukay rests on folk art, mythology, folk lore, fairy tales, and baits (epic verses). Tukay perceived this layer of folk wisdom delicately and organically, with intrinsic elegance, humor and inner warmth. Fairytale and enchanting are his poems «Hay Market, Or New Kisekbash», «Kazan and Zakabanye», «Water Spirit», «Shurale», «She-Goat and Ram». His stories, though small in volume, are amazingly capacious and purposeful. The laconism of his poetry contains wisdom, lambent wit, and indomitable imagination. The types are revealed so vividly, and the description of the epoch and characters is so precise. For talented artists it is a mine of themes and plots, an inexhaustible source of inspiration. The first illustrations of Tukay’s themes appeared starting from 1906 in the lifetime editions of the poet, for example, an illustration of an unknown artist (signed NK) for his verse «Glass Head», full of sharp satire. Later, in the period when Tukay worked at «Yashen» («Lightning») and «Yalt-Yolt» («Shine») magazines, the drawings and cartoons by G. Kamal were published. Also at that time the Tukay’s fairy tale «She-Goat and Ram» and collections of verses for children were illustrated. The names of artists are unknown, and their works lack professionalism. But it was a necessary stage in the evolution of the Tatar book illustration, without which it would have been impossible to achieve the level of mastery reached by such artists of the 1920s as I. Pleshchinsky, S. Muhametzhanov, G. Arslanov, and the early B.Urmanche. The drawings reveal the desire to show the point more precisely and significantly and comprehend the essence. The avant-garde style can be traced in works by Pleshchinsky. They are laconic, grotesque and symbolic. No matter what was happening in the country, the interest towards Tukay’s art never faded. In the 1930s, illustrations of Tukay’s works were supplemented by B. Almenov. His first works dedicated to «Shurale» poem were black-and-white drawings done by pen for a small-size edition. Later on, he created bright and masterful illustrations for Tukay’s fairy tales. The role of colours in these realistic works is very important, since their richness and brightness help reflect the fairytale world of Tukay’s characters, making it recognisable and close, especially for children’s perception. K. Yakupov worked in the field of book illustration at the same period. He created a series of works for Tatar folktales and works by Tukay. F. Aminov, a fine lyric artist, places the poet’s image into the canvas of a fairytale narration about Kyrlay, into a sequence of pagan images of Shurale, forest monsters, birds, grasses, leaves and flowers. His paintings, made with tempera, are almost aquarelle-like. They are filled with an unusual rhythm, and the glow of lilac-blue shades adds to them the Vrubel’s fabulousness. The fairytale panoramas of the Shurale’s forest and its inhabitants in his works are a true masterpiece in revealing the theme. He perceived the world of the poet’s images in their poetic consistency. The charming instability of the folklore realism, the whole poetic imagination got a new life and a truly jewellery frame in these works. In the «Shurale’s Forest», the artist resurrects the atmosphere ofprimeval forests and the image of Shurale acts as an impersonation of the forces of nature. The entire figural world in works created by Aminov is woven of planes glistening with gems and silver filigree, and possessing an inner flexibility of vibrating spots. His painted world is ruled by the atmosphere of fairy tale, fantasy, mystics, and irreality. Very original in its figurative solution is «Taftilyau» made by I. Akhmadeyev. In his exquisitely decorative work, tracing its roots to the elegant and colourful Oriental miniatures, the author has transformed the poetic associations caused by the poet’s verse of the same title. The space of the work comprises the bent vague and semi-transparent female figures, spiritual and tender. The composition of the work is filled with an intricate ornamental rhythm. 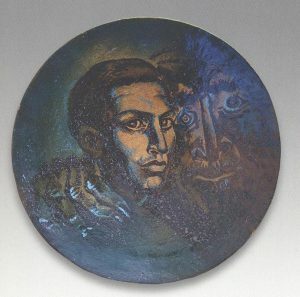 The graphic series created by Urmanche in the 1960s based on «Shurale» poem were monochrome and tended towards the realistic treatment, but gradually, fifteen years later, they ascended to polychromy consonant with the folk art of the Kazan Tatars, their jewellery, embroidery, and leather mosaic. Done by China ink and slightly touched by tender aquarelle, the sheets are breathing, they are light and transparent. Every line is playing and is full of life. The white background, upon which the golden orange and emerald-green spots are gliding, also plays an active role. The light, almost non-material brushwork and the vagueness and changeability of the white background, against which fancifully intertwining are the images of forest, flowers, leaves and Shurale himself, organic, flexible, naive, credulous and capricious, comprise an impressive originality of this cycle. The Urmanche’s illustrations for «Hay Market, Or New Kisekbash» poem are made in the same style. The expressiveness of pictorial means in the reproduction of types and the atmosphere of a city square is achieved by the artist through the flatness, decorativeness, locality of colour and enhances the perception of the poem. Visible and tangible is the realistic picture of the bazaar crowd, gossips and talks, a rattling tram. All this combines with irreality of what is happening: the appearance of a talking head, images of Karahmet and div, the underwater kingdom of Lake Kaban… Based on this series of illustrations the author decided to create a monumental frieze for Tukay’s Museum in Kazan. In his sketch the artist unfurled the story on an elongated wood frieze like frames of a movie. However, the idea remained unfinished. Urmanche fulfilled it with ink on paper in another work. Preserving the genre aspect in the treatment of images, the artist reveals the artistic plastic and enhances the blending of satire and lyrics. Fairy tales and poems of Tukay were illustrated by many well-known graphic artists. The «Water Spirit» by V. Karamyshev is splendid in its tender spirituality. He created several works featuring this image. Following his early series of illustrations, the artist showed the characters of this fairy tale in easel aquarelle paintings. N. Almeyev creates an original series of illustrations in the form of etches. Organically combined in his creative research are the ornamentalism tracing its roots to the national perception of the world and the new means of reproduction of space and time. T. Khaziakhmetov created bright and dynamic illustrations which enlivened the poet’s verses for children. These verses are filled with a touching feeling of love for nature and children. With talent and humour, in a lively and festive manner, T. Khaziakhmetov managed to reveal the world of children showed by Tukay. The illustrations by I. Kolmogortseva for Tukay’s fables and poems go back to national ornaments. The masterly lines of the etches, turned into fanciful patterns, fill the entire surface of the sheet, revealing an amusing and edifying world of Tukay’s fables. The works by F. Khasyanova for «Kisekbash» are filled with merry prowess, and funny and expressive scenes. Her graphic works always go into the world of childhood, and, for this reason, the brightness and polychromy of colours contain numerous details and the grasping genre scenes. In easel painting, the artists give different interpretations and create their own associative world inspired by motifs of Tukay’s poetry. The fantasies of V. Arshinov tend towards symbolic generalisation. The philosophic and allegoric side of Tukay’s poetry can be seen in the easel works by G. Eidinov. As far as plots are concerned, the genre sculpture of Tatarstan was enriched by expressiveness of Tukay’s characters. They were often used in the art of such sculptors as B. Urmanche, N. Adylov, and R. Nigmatoullina, who interpreted their images in different styles and manners. The very atmosphere of forest and its inhabitants suggests a conditionally-symbolic treatment. The old-fashioned witch-mermaid, Su-Anasy, is seductively beautiful and tender in realistic works; these features are expressed in her inclined head, the falling hair, and the arched silhouette. the triumph of the young man over Shurale. The subject is executed in the form of a merry, scintillating with wit genre scene, in which the artist has revealed the courage and adroitness of Byltyr. The image of Shurale provides rich material for its embodiment in wood sculpture. Numerous fanciful images of Shurale were made from naturally curved tree roots. Urmanche created an excellent series of extempore fantasies dedicated to Shurale: the nosed Shurale, thick-lipped Shurale… He also created decorative vases for Tukay’s museum in Kyrlay. In terms of style, the filigree carving with masterly cut plots and images of characters have something in common with aquarelle works. The golden monochromy of wood adds splendour to works by Urmanche. Very original is the art of A. Fatkhoutdinov. The artist refers to the world of pagan images, creating house- and wood-spirits, inhabitants of cowsheds, steam-baths, houses, and forest through the synthesis of painting and wood plastic and carving. He touches the whole layer of mythology and folk lore, and unfurls a panorama of fanciful images. The modern art of Tatarstan is developing in different directions. The artists choose various materials for their works. I. Basnmakov creates original compositions of metal using the technique of hammer-work. His works are often surprising and catchy; they contain the echoes of traditions of the old smith craft. The artist often works within the Tukay’s theme, creating in metal the images from his poetry. In one of the panels from «Kazan, the City of Poets» series, Kazan is shown as it looked at the time of Tukay. The noble sounding of metal underlines the austerity, beauty and elegance of a diverse architecture of Kazan. The composition of candelabrums made based on Tukay’s verses «Fatima and Nightingale» and «Winter and Spring» produces a feeling of light and airy aroma of Tukay’s style. These images formed a basis for creation of a monumental composition, the city clock, which was installed in the centre of Kazan and has become one of its symbols. The masters of decorative and applied arts reproduce fairy tale plots using various means. The decorative panels by Z. Biktasheva are a bright and original interpretation of Tukay’s poetry. Her art takes its roots in the Tatar embroidery and art of calligraphy. The generous richness of the figurative world of Gabdoullah Tukay and the captivating wealth of the energetic and melodic style are an inexhaustible source of inspiration for masters of art. The world of works created on the basis of Tukay’s art is extremely diverse and comprises a separate and glorious page in history of the Tatar fine arts. Through Tukay the Tatar art comprehends the spirituality of its people, its centuries-old aesthetic experience that achieved the peak in its expression in the personality and works of the poet.